Evergreen’s commitment to you means sound advice, genuine support, good information, and easily accessible resources are available to you. Academic Deans review student contracts and work with other offices to support teaching and learning at the college. They work closely with the Provost and Academic Vice President to set academic policy and work through daily concerns. View quarterly class schedules. Students should check class schedules frequently as class meeting locations change often. Faculty may schedule classroom space for their programs. Your learning and academic progress are assessed in narrative evaluations rather than grades. You will receive evaluations from faculty, as well as write your own self-evaluation for each offering. Get in touch with your faculty, learn more about them, or see what upcoming programs your favorite faculty are teaching via the Faculty Directory. View details about all of the computer labs and classrooms that you have access to as an Evergreen student. All your textbooks are available from the Greener Bookstore. You can also get school merch, clothing, snacks, and games. The Daniel J. Evans Library provides online research resources, books, special collections, research assistance and more. Media Services provides instruction, production, and classroom support in audio, video, animation, film, and photography for students, faculty, and staff. Twenty four acres in the northwest portion of the Evergreen campus are dedicated to agricultural and ecological studies. The Organic Farm’s five-acre plot includes the Farmhouse, Demeter’s Gardens, Community Gardens, the compost facility, the workroom, tool shed, greenhouses and a 3 acre production area. 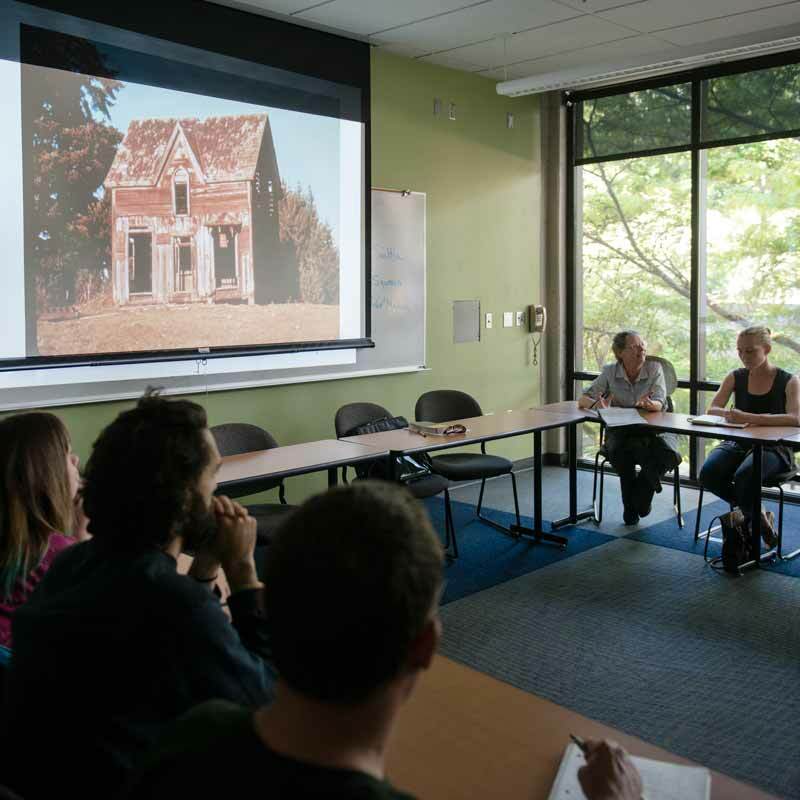 Photoland is the photography hub of Evergreen. It offers photo supplies, professional film processing, photography, and digital printing. The Quantitative and Symbolic Reasoning Center—QuaSR for short—is committed to making a supportive space for math and science students at Evergreen. Sit and do your homework, get individual help or work in small groups. The Science Support Center provides support for research needs, and aids students in independent learning contracts, SOS programs, and graduate and undergraduate research. The instrumentation site holds information on all major scientific instrumentation tools. Students may request training, schedule lab time, and find resources on using the equipment. Whatever level of experience or confidence you have with writing, you can explore and strengthen your writing process at the Writing Center. Tutors work with you on your writing and support you in navigating the different types of writing you encounter at Evergreen. Academic Advising will help you understand your educational options, plan your academic path, and succeed as a learner. Educational aids, services, and accommodations are available to students with disabilities. The Center for Community-Based Learning and Action (CCBLA) links Evergreen students and faculty with organizations working on a wide range of issues. This multicultural student center assists students in achieving their goals through academic, social and personal advising, referrals to community resources, and community-building events. The Trans & Queer Center supports Evergreen’s lesbian, gay, bisexual, transgender, queer, questioning, intersex, asexual, and agender students, faculty, and staff. TRiO Student Support Services is specifically designed for first-generation students, low income students, and students with a disability who have an academic need. We encourage you to take advantage of these resources. We are here to help you.